Press freedom and the rule of law in Turkey suffered yet another blow yesterday. In a detrimental ruling, an appeals court in Istanbul upheld the guilty verdicts and sentencing of independent newspaper, Cumhuriyet’s journalists and staff members. The defendants who were charged with “assisting a terrorist organisation whilst not being a member” and “propaganda of a terrorist organisation” on 26 April 2018 were handed prison sentences of between two years and six months, and eight years and 1 month. According to the court ruling, many journalists, the accountant and board members of the newspaper – who have previously served lengthy periods in pre-trial detention – will have to return to prison to serve the remainder of their sentences. We, the undersigned international freedom of expression organisations, who have closely monitored the Cumhuriyet case since its inception in 2017, strongly condemn yesterday’s ruling. From the outset, the charges against the defendants were politically motivated and utterly ungrounded, lacking sufficient evidence and aimed at silencing the remnants of independent journalism in Turkey. We condemn the upholding by the regional appeal court of these sentences that were representative of a clear miscarriage of justice. We support the appellants right to have their case examined with urgency at the Constitutional Court. Sarah Clarke, ARTICLE 19’s Head of Europe and Central Asia, said, “The decision of the first instance appeals court in upholding these politically-motivated sentences is yet another example of the lack of a functional judicial system and domestic remedy in Turkey”. IPI’s Turkey Advocacy Coordinator, Caroline Stockford, added: “the decision to uphold the sentences, especially following such a lengthy politically-motivated trial and lack of evidence against the defendants is a clear demonstration of the lack of the rule of law and domestic legal remedy in Turkey today”. “Charges brought against staff and journalists from Cumhuriyet were designed to harass, intimidate and ultimately stifle independent voices in Turkey. We firmly condemn yesterday’s verdict and call for the sentences and convictions of all defendants to be quashed” said Carles Torner, Executive Director of PEN International. Rebecca Harms, Green Member of the European Parliament underlines that “in the European Parliament we continue to support the fight of the remaining free and independent media in Turkey against the state’s repression. We call on Turkey to drop the charges against the journalists, free them immediately and return to the respect for media freedom and pluralism”. Antonella Napoli, Advocacy Turkey Coordinator of Articolo 21 insists that “representatives of European Institutions demonstrate their solidarity with Turkey’s remaining independent media and pressure Turkey to reverse these appalling sentences. Dropping these charges should be a condition in any political and economic dealings with Turkey”. 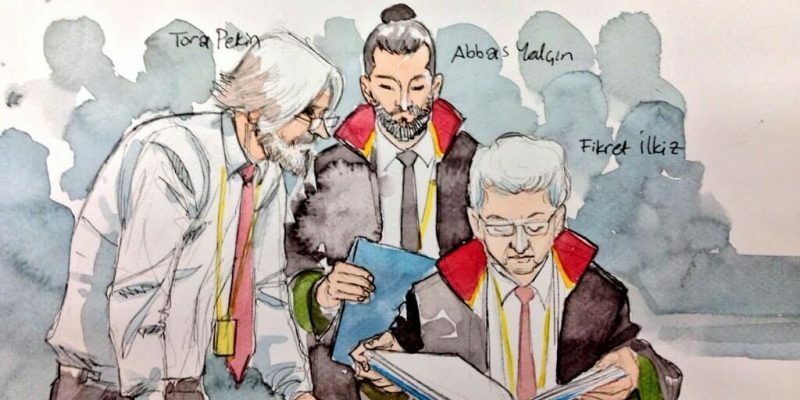 According to yesterday’s ruling of the 3rd Criminal Chamber of the Istanbul Regional Court of Justice, the following defendants will have to serve remaining imprisonment terms of between one and three years: columnists Hakan Kara and Kadri Gürsel, board member Mustafa Kemal Güngör, cartoonist Musa Kart, accountant Emre İper, ombudsman and journalist Güray Öz and lawyer Bülent Utku. The defendants were all initially kept in pre-trial detention and subsequently released during the proceedings. According to the Turkish court system, today’s decision is final and can only be overturned by the Constitutional Court, which is overloaded with an enormous backlog of cases. Appeals of the other defendants in the Cumhuriyet’s case: Ahmet Şık, Akın Atalay, Aydın Engin, Hikmet Çetinkaya, Murat Sabuncu and Orhan Erinç, will be heard by the Court of Cassation, which has jurisdiction over cases with penalties over five years of imprisonment.